Breakdown: “The show will go on!” the race director’s voice booms excitedly from the speakers as groups of runners huddle together under various overhangs and race tents, delaying their inevitable exposure to the pouring rain. It’s just before 8am on Saturday morning and it has been raining steadily for hours with no signs of letting up. And still, almost seven-hundred runners are gathered in Chinatown Square to tackle the Chinatown 5K. Briefly, the rain does lighten just before the official start, but then it comes back full force within a few minutes, making for a very wet street race. But despite the weather—or, perhaps, because of it—a jovial atmosphere permeates the entire race, with more starting-line chatter and looks of excitement than I’ve seen at any race outside of an obstacle run (where the joviality is almost more important than the run itself). “Maybe we don’t even need to put water in the cups!” remarks the race director, describing the water stations along the course. She’s not far from the truth. I’m completely soaked within seconds of checking my gear (along with my precious umbrella) and approaching the starting line. 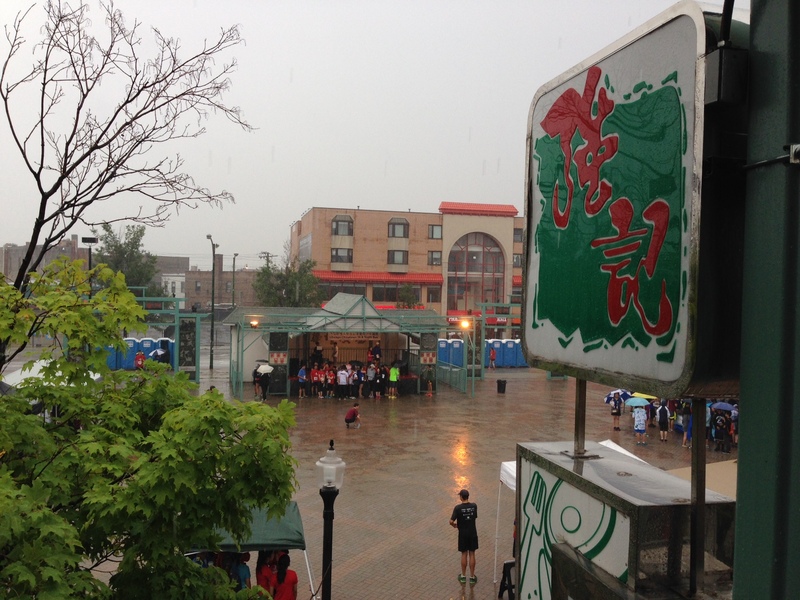 Running through the streets of a rain-soaked Chinatown a few minutes later—after a brief delay to get the timing system restarted (those machines are hardy, as race results were all registered)—it’s a surprisingly freeing feeling to run in such a downpour. Course: After a last-minute notice from the Department of Transportation, the race course was reverted back to its original out and back along Wentworth (a newly mapped course was to follow 26th Street into Bridgeport). Lots of miniature rivers to splash through along the way. Organization (gear check, etc. ): As usual for this race, everything ran like a well-oiled machine, even if said machine was experiencing high levels of water damage on race day. Goodie Bag (includes shirt): A nice-looking dark gray running shirt, a Thai energy drink and a single-serving of soy milk. *As a side note, I was scheduled to run the Ridiculous Obstacle Challenge (R.O.C.) 5K soon after this race but due to starting delays brought on by lightning, I was unable to.